A watershed is the entire land surface that drains into a particular river or stream. 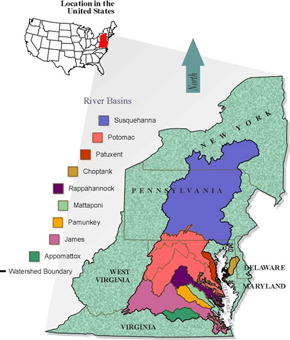 A watershed may also be called a catchment or drainage basin. A watershed for a large river is made up of the smaller watersheds for each creek or stream that flows into the river. Charlottesville lies within the boundaries of the Rivanna watershed. The Rivanna watershed is part of the James River watershed, which is shown in pink on the Chesapeake Bay watershed map. The James River empties directly into the Chesapeake Bay. As a result, Charlottesville is a part of the Chesapeake Bay watershed. This means that all of the rainfall in the Charlottesville area could potentially reach the Bay. The two watersheds of the main grounds of the University are the Meadow Creek and the Moores Creek watersheds. Meadow Creek and Moores Creek are part of the Rivanna watershed. A Stormwater Management Master Plan has been developed for each of the watersheds on Grounds. All future development on grounds will be guided by these plans with respect to stormwater quantity and quality. The headwaters of Meadow Creek lie on the eastern flank of Observatory Hill and on the western side of the Grounds. At the base of Observatory Hill, Meadow Creek enters a stormwater sewer system that conveys the stream under the Facilities Management complex to just east of Alderman Road. A daylighting project in 2003 has restored the stream to a natural state, between Alderman Road and Emmet Street complete with meanders and floodplains. Vegetative swales, floodplains, and riparian buffers serve to prevent erosion as well as to filter out pollutants and particulate matter from the water as it flows through the Dell. The reconstructed stream then flows into a retention pond where natural physical, biological, chemical processes improve the quality of the water. Water flows from the pond via a pipe which takes Meadow Creek under Emmet Street. As part of the John Paul Jones Arena project, another portion of the creek was daylighted on site to increase the quality of water discharging from University property. Additional information about UVA’s development in Meadow Creek can be found in the West Side Stormwater Management Master Plan. The Moores creek watershed drains a large portion of University central grounds including most of the Lawn, Hospital Complex, Stadium, Engineering school and the Gooch-Dillard and Hereford residence areas. The stream itself is not found anywhere on grounds, but smaller streams, such as Rock Creek and Morey Creek are tributaries that drain into Moores Creek. Moores Creek is classified as a stressed stream, meaning that suffers from significant pollution, flooding, and erosion problems. 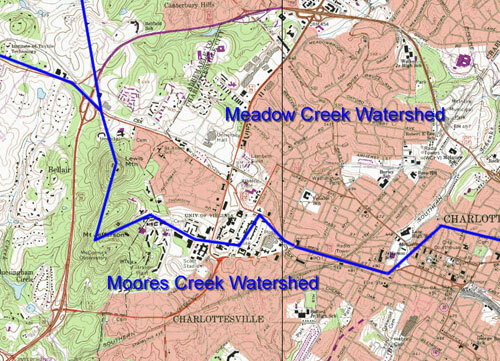 The UVA Moores Creek Stormwater Management Master Plan seeks to ensure that water leaving University property does not further contribute to Moores Creek’s stressed condition. Future development on Grounds will improve stormwater leaving University property which will help to improve the overall quality of Moores Creek.